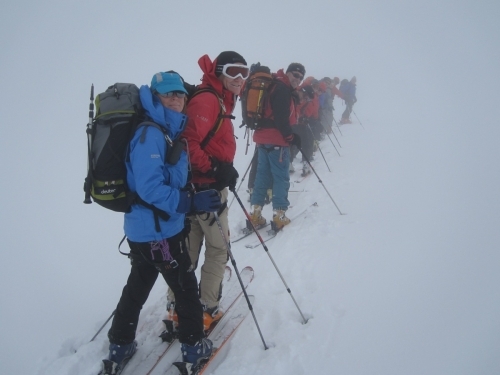 Ski Mountaineering is fast becoming as popular as the Wednesday Wanders. This year no less than 16 members were out there doing it over the Easter period. The first week was spent at a luxury apartment on the shores of Lac Leman, an unlikely venue you might say. However, within an hours drive in any direction great skiing is to be had. Seven of us shared this week; Josie & Bernard Smith, Dave & Cathy, Jo & Jason Whiteley & Sarah Medcalf. 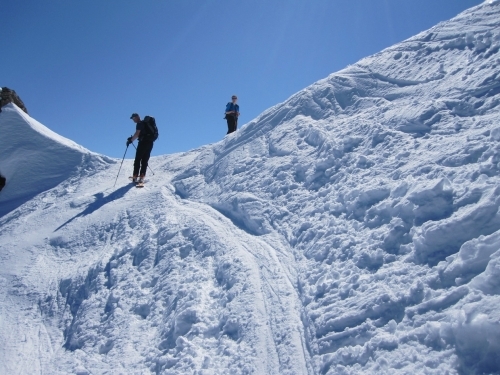 We loosened up on the pistes of Leysin where there is a wonderful facility provided free, an area of buried transceivers for practicing avalanche drill. We then enjoyed four day tours under cloudless skies, the first being an ascent of Pic Chaussy (2350m) from the Col des Mosses giving great spring snow on the northern slopes. This was followed by days on Tour de Famelon above Leysin, where the scenery was superb, the Dent de Valerettes (2058m) above Monthey and the Croix de Javerne above Bex. All of which were terrific days out. We ended the week skiing the magnificent Combe D'Audon from the Glacier 3000 cable car, some of the best lift assisted off piste around. For the second week we moved over to the Bernese Oberland. Eleven members assembled in Interlaken: Mark & Janette Braithwaite, Claire & Iain McClellan, Duncan Scattergood, Clare Stafford, Dave & Julie Sudell, Nigel Lyle & ourselves. Mark had reserved a compartment on the Jungfraujoch Railway so we enjoyed the trip through the Eiger onto the Aletschgletscher. We skinned over the Monchjoch then skied down the wonderfully named Ewigschneefeld to Koncordia from where we gasped our way up the ever growing stairway to the hut. On the second day we moved over to the Finsteraarhorn hut taking in the summit of the Wyssnollen (3590m) on the way. We had enjoyed 2 glorious days but unfortunately the weather now deteriorated. We had light snow and poor visibility for the next three days which limited what we could do. 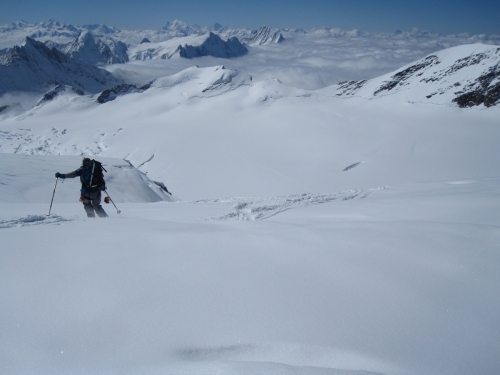 We set off for the Fiescherhorn on day 3 but turned back at the icefall in near whiteout. A practice crevasse rescue was set up so as not to waste the day entirely. Frustration again on day 4 as we set off in thick cloud for Koncordia, however, it cleared as we descended so an attempt on the Grunegghorn was made which didn't quite succeed but gave a great ski down before the plod up the stairs to the hut. Plans were made for the morrow, which again were frustrated by the weather and all we achieved was a transfer to the Hollandia hut in the mist. However the forecast promised an improvement for our final day and this proved to be a fitting finale. An ascent of the Albeni Flue (3982m) provided some consolation for the previous frustrations and a fantastic ski down, all the way to Blatten down in the Loschental. As we had come to expect the Swiss transport system whisked us back by bus and train to our cars in Interlaken where we went our separate ways.